If you're concerned about what those cheap blank CD and DVD discs that you've purchased at your local computer shop or grocery store, then you might want to take a quick look at Nero's free tool Nero InfoTool. 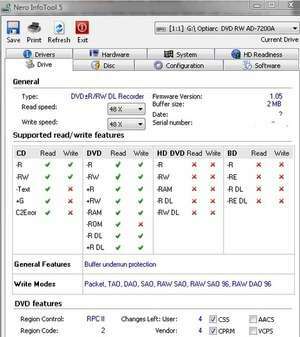 InfoTool provides you with vital information about the write speeds, supported formats and other detailed information about discs and drives. Are those discs you got at Walgreens really able to burn at the speeds advertised? This tool can give you some more insight. Version 11.0.00500 is a freeware program which does not have restrictions and it's free so it doesn't cost anything. For security reasons, you should also check out the Nero Infotool download at LO4D.com which includes virus and malware tests. Additional screenshots of this application download may be available, too.